Stop, look and listen for light rail vehicles before crossing at designated crossings. With the launch of light rail just around the corner, are you rail ready? LRVs can move quickly and quietly. Earphones, and other distractions like reading, texting, taking photos or selfies can put you at risk. Pay attention and stay alert at all times around light rail. Take care when pushing a pram. Ensure you push across the tracks so the wheel doesn't get stuck in the track. If you're a cyclist look out for the tracks on the road and do not ride immediately adjacent to the rail track. Your cycle wheels may get caught in the rail groove. Ride directly across the tracks at a right angle to avoid your wheels getting stuck in the groove. Do not to queue across the tracks at any time. Road rules stay the same. Always obey traffic lights and road signs. If everyone follows the rules, we all stay safe. When in operation, light rail has a total capacity of approx. 207 with seating for 66 passengers, and will have four bike racks, two dedicated wheelchair spaces and 12 priority seats. Motorists, cyclists, pedestrians and all road users are urged to be vigilant, aware and alert when travelling along the light rail corridor. 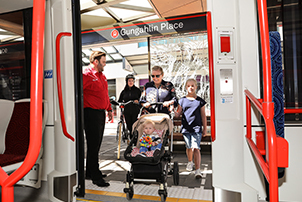 For more on the launch of light rail visit Transport Canberra.